Think about this. Everyday for countless number of minutes, from many Republican Conservative talking heads you hear the same message: Lower taxes, reduce spending, the federal deficit is out of control and of course, Obama, Harry Reed and Nancy Pelosi are the evil doers. Yup. They did it. Oops. Sorry. Was not there a budget surplus when Bill Clinton left office. Was not there a budget shortfall when GBII left office. Nuff said. My message remains the same. It is time for new leadership at the Democratic Party. You cannot win football games with the same losing strategy. Same thing in politics. If winning is not a value, we need to make it one. Playing with the purpose of losing as a strategy cheats spectators out of their money. We need leadership committed to win. Nuff said. We need a new revitalized Democratic Party that stands on its values. One of these values is healthcare. National healthcare is not socialism nor communism, it is captitalism at work. There is nothing wrong with us citizens banding together to provide a good that the market cannot. Or as is the case this time, we collectively can drive the price of healthcare down by creating this thing called competition. National healthcare is all about competition. Many negatives have been said about national healthcare. None have been proven. National healthcare is good because it creates competition. Now that the November election is behind us, it is time to sit back and relax and ponder. I believe that this election more than any other since I have run for public office shows that it is time for us to take charge of the Democratic Party and loudly demand new leadership. I have read many analyses of what happened, what has to be done, and blah, blah, blah. It is the same old stuff in the same old stuffy bottles. We got whupped. And I say we because I am a Democrat and proud of our party. The thing about losing is – I do not like it and I am certain that none of us like to be on the losing side in elections. So let’s see how we can stop the bleeding. The Dallas Cowboys recently demonstrated what happens when a leader fails and you are on a losing streak – you replace the leader. We Democrats need the same change. On the top of the list is a change in leadership. We need to accept the possibility that the Republicans are going to be in charge for several years, so we must move on from the current objective of simply holding on to what we have. There are good stalwarts of the Democratic Party and they need to stand up and let us know what they are going to do to stop this losing streak. As for all the political advisors who had the winning formula for this past election – they need to be fired along with the head coach. I know there are many of you concerned about the state of the Democratic Party, well – now is the time to turn concern into action and elect a leader who will demand more than simply “doing better than last election.” We will never win an election if the only objective is to improve the numbers for the possibility of a future victory. We raise our hand in salute to our Veterans! 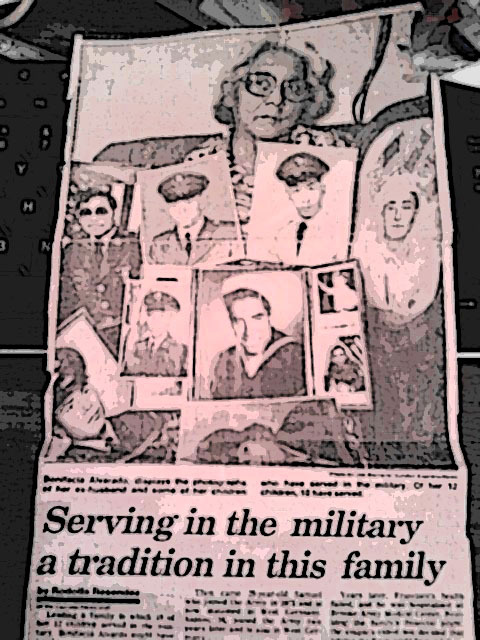 A tradition that began with Francisco Alvarado, my father, the Alvarado’s have continued in his footsteps and served proudly in all four branches of the armed forces and the Texas Air National Guard. As his sons and daughters we followed suit and answered the call to duty and served honorably. Now our children and grandchildren are doing likewise. Today, we celebrate the lives of the many men and women who have dedicated their lives to defend and protect our freedoms – our way of life. To the men and women in our U.S. Armed Forces…the Alvarado Family salute you. To the families who support to our veterans, we thank you. God bless you!